Today I have a couple holiday polishes from the line Anne Kathleen. 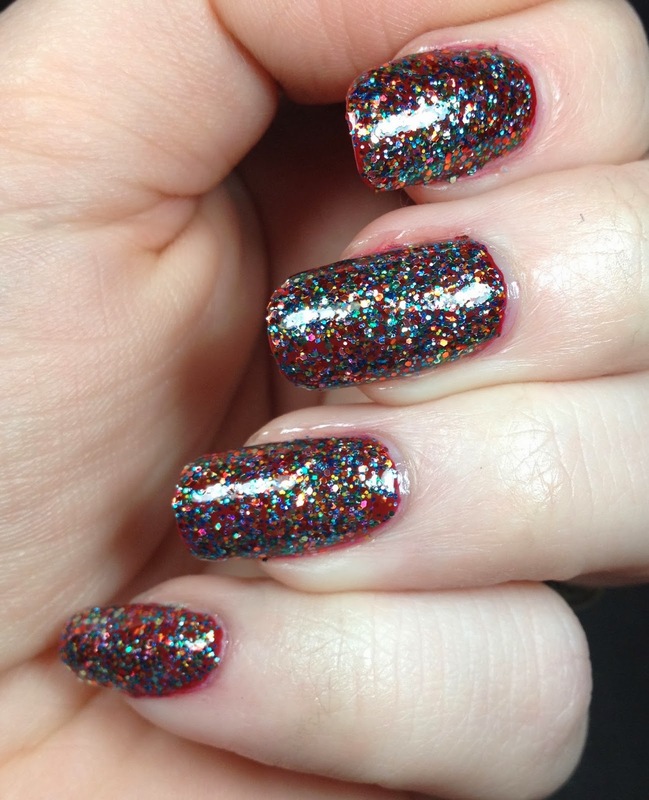 Leanne, the owner, was kind enough to send me two of the polishes from her Yuletide Wonders collection. First up is Eve, a dark grey holographic polish. 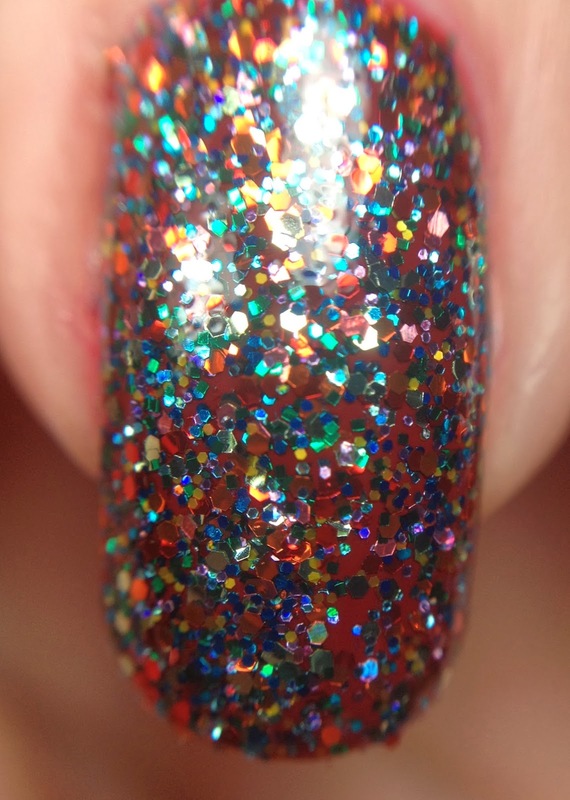 This may not be the strongest holo polish in the world but it is subtly beautiful. I wore this for a couple days and had no chipping and hardly any tip wear. The pictures below are two coats of Eve over Duri Rejuvacote and topped with Glisten and Glow HK Girl. I have tried to provide enough photos so you can see the rainbow in the polish. 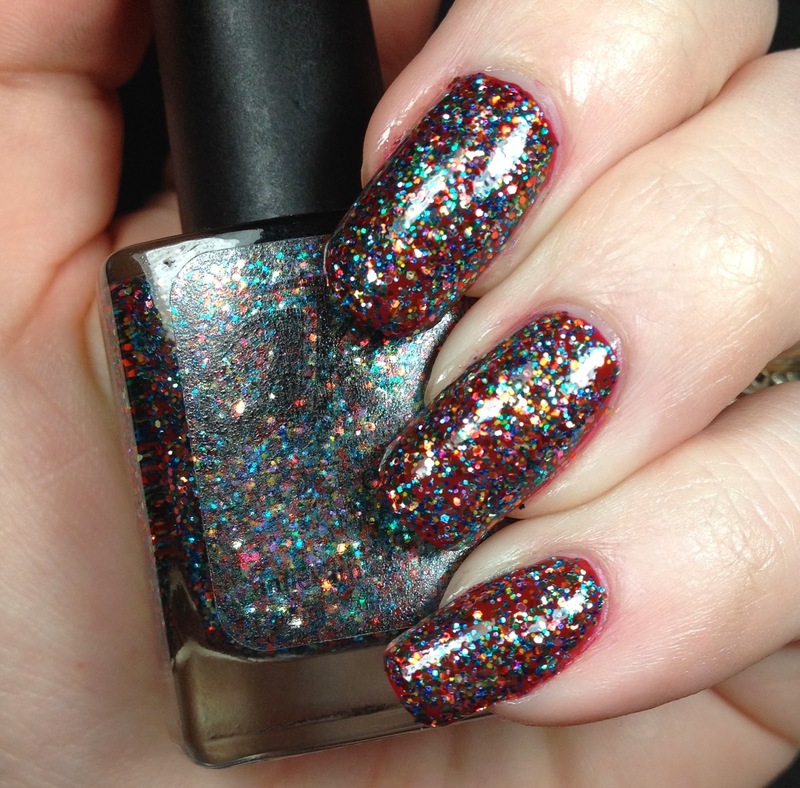 The other polish she sent me was Ilana a glitter topper with red, green, orange, yellow, blue, turquoise and violet glitters in it (color listing from Anne Kathleen). Funny story about this, I saw the polish in the bottle and was immediately thinking about what to pair it with for undies. So I grabbed Julep Anisa (I got that in my most recent Allure Beauty Box) and used that for undies. So I take Ilana and go to use it, imagine my surprise when the glitter payout far exceeded anything I was expecting. It was amazing. This could potentially be a one coat glitter polish, it's that dense. You get your moneys worth for sure on this one. So, as it turns out I probably didn't even need to put Anisa on! I am still wearing it as I write this post. I have had it on for two days and it's still wearing like iron. This is shown with two coats of Glisten and Glow's HK Girl topcoat. You need two because it's so dense with glitter. I am very happy with these polishes and would not hesitate to purchase from this store in the future. Polishes are cruelty free, and the majority of polishes are vegan (though there are a few non-vegan polishes).